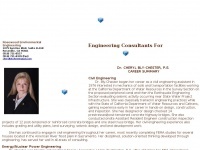 Consultants for environmental conservation, nuclear power and civil engineering. The web server used by Cherylblychester.org is located near the city of Marietta, USA and is run by NationalNet, Managed Services. The website Cherylblychester.org has a own web server. The web server only runs this website.